The train is an extension of my bed. Two hours of my daily life is alloted to traveling by train. Every morning, I and my other officemates see to it that we have a good seat so as to doze off to dreamland. You just don't know how crammed the insides of a Japanese train is. Getting a good sleep inside the train has its advantages. First, you can't see the human sardines standing in front you, though you can feel, smell them. But as long as your eyes are closed, you need not to worry. Second, you are refreshed and may have a renewed spirit before going to work. One disadvantage is that if you are far from your co-employees, you may wake up stations away from your destination. It happened to once. That's my morning routine. At night, there's no other option but to submit your body to the human sardines. I hate rush hours. My only consolation is the city lights visible through the train windows and doors. At some point, you realize that Japan life is indeed fast-paced. But would you believe, I can manage to sleep while standing? Yeah, must be the result of overtime work. Haha! On weekends and holidays, the train is more spacious and you can appreciate the travel even without sleeping. My train rides are comparable to my experiences while riding the bus (when I was in the Philippines and Thailand). Real-life canvas are showing off before you. I even try taking photos while inside a moving train. Crazy stuff photography is. of the breeze in the daffodils. colors marks on the sky. of the wind cradles me in sleep. my feet off the bus. Ah, the wonders of Mother Nature, we seldom see and appreciate. Can't wait for my next train trip. I may be in dreamland or in the real world. For almost two years I honestly have had fear of taking the train alone. There was always 'Uncle Dave' to drop me off at work or pick me up after. Or anywhere I went, even to the closest station to our house. But when I decided to live alone, everything has changed. I struggled the long-hour-ride, it was to me even if it roule only take about 10-15mins. But now, I think I have adjusted to being squeezed in, or getting dragged to motion and ewww, their foul smell that I could hardly breathe. 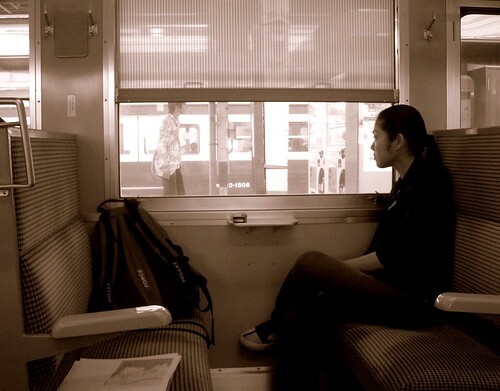 I could still remember my first travel alone, I was from Yokohama going to Shinjuku at an early rush, I abhorred that day and dreaded going back to work the next day. 3-4 days after, I did quit. Either it's Shinkansen or my own pocket was at stake every day. Recently, I could say I have well adjusted to the local train ride. I won't complain about the hour-long-ride, or the change of train lines. Although I admit that sometimes it's taking my patience to the edge when I need to rush. At least I could say now that I am less agitated taking a local line on a long travel. Anyhow, let's go Cirque de Soliel. But it's not in Ikspiari. I don't know where Attorney got the idea about :p It's in Harajuku New Big Top. The show has just started this month and will in Japan-tour for 5 months. i totally thought for some reason you're married. lol. cheers to us lonely hearts. :) or maybe just single hearts. i try not to be lonely. this is a beautiful portrait in sepia. makes me wonder what the subject is thinking. but train ride is a challenge write. haha. its just to bad when we are in business suit but you are squeezed in by others haha. You have captured the train experience so vividly. I used to travel via train when I lived in Ireland, and it was always like that--at once being part of the landscape and quite distinct from it. A strange, disembodied prowling. Too bad the walk takes longer time than my train ride to and from work. Ipods, portable gaming devices, books etc, are pretty useful when travelling here in Japan. The only way to travel by train in Thailand, is overnight - when you sleep anyway. I like it that you still manage to find something good in that routine, something to inspire you. Your poem was beautiful...you captured with vivid imagery that 'mind wandering' experience that takes place while passing time on public transportation. Lovely! Really lovely. And I love your observation that the train is an extension of your bed! My bus is the same. @Stan, but Thailand has metro rail too right? I enjoyed reading about your train rides. So different from here. Beautiful descriptions! Makes me wish I lived where there was a train I could take to work. I long to take a train ride around these United States ... there is so much beauty to see ... I enjoyed this ride with you. mother nature is so beautiful to look at from train or bus (better nice sleeping bus) remember many nights going over the indian desert, window opne, wind softly blowing my cigaratee smoke, thousends starts moving as far as the bus goes..hamming sound of rolling wheels, people passing by with camels, comming from difrrent eras, diffrent nights. "you may wake up stations away from your destination. It happened to once. That's my morning routine."
. I experienced it a lot of times..
@4wind, how different from yours? thanks kikit :-) are you from TF right? TF? by the way, thanks for the comment at my site. no worries. ill try to visit it from now on. I like that picture, very well observed. Like the picture, and the text. I did also learn a little more about you..., and I liked it. Fantastic post and immage! You do excellent work and it's such a treat to come here! There's a lovely mood captured in this image. I suppose it's good for the environment that so many people take the train, but does no one ever complain that there aren't enough trains? This is cool. Capturing this kind of photo inside the train can interpret in many ways. Keep it coming.